Perhaps nothing changed the face of America more than the creation of the interstate system. At once man-made wonders, economic pipelines, agents of sprawl, and uniquely American sirens of escape, the interstates snake into every aspect of modern life. 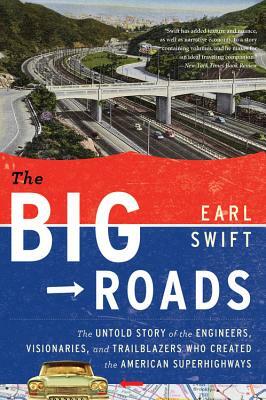 The Big Roads documents their historic creation and the many people they’ve affected, from the speed demon who inspired a primitive web of dirt auto trails, to the cadre of largely forgotten technocrats who planned the system years before Ike reached the White House, to the thousands of city dwellers who resisted the concrete juggernaut when it bore down on their neighborhoods. The Big Roads tells the story of this essential feature of the landscape we have come to take for granted. With a view toward players both great and small, Swift gives readers the full story of one of America’s greatest engineering achievements. EARL SWIFT is the author of three previous books, including Where They Lay, a 2003 PEN finalist. He lives in Virginia with his daughter Saylor.